I'm a great admirer of both Yo Yo Ma and Atom Egoyan, so was naturally excited to learn what a combination of their artistic forces would look and sound like. 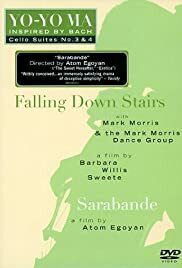 'Sarabande', like the other episodes in Ma's TV series 'Inspired by Bach' had to fit in a 1-hour format, and Egoyan's solution to that restriction was to come up with a loosely cut collage of scenes from the lives of five people that intersect around the performance of Bach's cello suite #4 in Toronto. The fly-on-the-wall feeling this generates will be familiar to admirers of Robert Altman's films, which are often about randomly intersecting lives that can sometimes have a profound influence on each other. In fact there is another connection, since Lori Singer plays a cellist in both 'Sarabande' and Altman's 'Short Cuts'. The different angles on music & life of the main characters are matched by the very different 'angles' from which you hear Bach's music: in concert, in a masterclass, on the radio, in the back of a limousine, in a doctor's office. Mr. Ma plays himself, and delivers his lines just as convincingly as the professional actors around him. There was a very curious dichotomy in votes at time I made this comment: a roughly equal percentage of voters gave it 8 or more as gave it 1. I'm at a loss to see what people in the latter category expected from this film that made them so bitterly disappointed.